Belleau Wood, near Chateau Thierry, France, was the scene of a World War I battle, 6 June 1918. (CVL-24: dp. 11,000; 1. 622'6"; b. 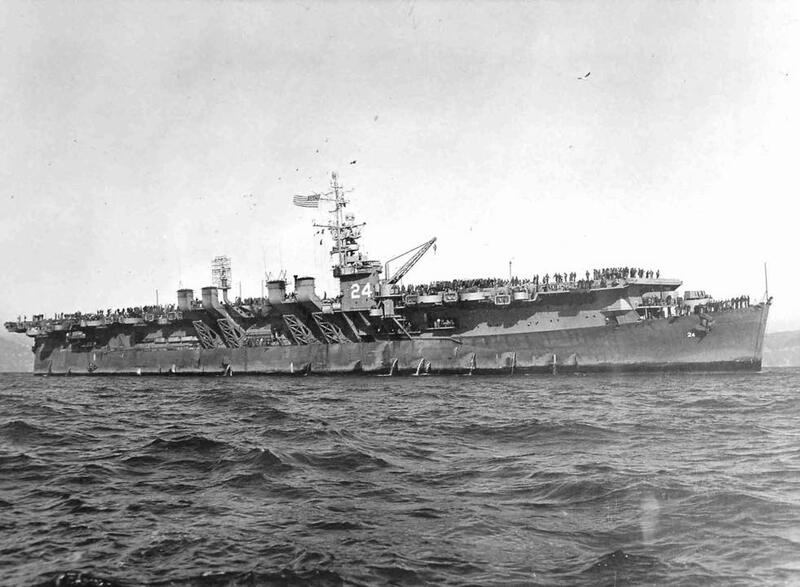 109'2"; dr. 26'; S.
New Haven (CL-76) was reclassified CV-24 and renamed Belleau Wood 16 February 1942. She became CVL-24 on 15 July 1943. Belleau 'Wood was launched 6 December 1942 by New York Shipbuilding Corp. Camden, N. J. ; sponsored by Mrs. Thomas Holcomb, wife of the Commandant of the Marine Corps; and commissioned 31 March 1943, Captain A. M. Pride in command. After a brief shakedown cruise Belleau Wood reported to the Pacific Fleet, arriving at Pearl Harbor 26 July 1943. After supporting the occupation of Baker Island (I September) and taking part in the Tarawa (18 September) and Wake Island (5-6 October) raids, she joined TF 50 for the Invasion of the Gilbert Islands (19 November-4 December 1943). Belleau Wood operated with TF 58 during the seizure of Kwajalein and Majuro Atolls, Marshall Islands (29 January-3 February 1944) ; Truk raid (16-17 February) Saipan-Tinian-Rota-Guam raids (21-22 February) Palau-Yap-Ulithi Woleai raid (30 March-1 April) ; Sawar and Wakde Island raids in support of the landings at Hollandia, New Guinea (22-24 April) ; Truk-SatawanPonape raid (29 April-1 May) ; occupation of Saipan (11-24 June) ; 1st Bonins raid (15-16 June) ; Battle of the Philippine Sea (19-20 June) ; and 2nd Bonins raid (24 June). During the Battle of the Philippine Sea, Belleau Wood's planes sank the Japanese carrier Hiyo. After an overhaul at Pearl Harbor (29 June-31 July 1944) Belleau Wood rejoined TF 58 for the last stages of the occupation of Guam (2-10 August). She joined TF 38 and took part in the strikes In support of the occupation of the southern Palaus (6 September-14 October) ; Philippine Islands raids (9-24 September) ; Morotai landings (15 September) ; Okinawa raid (10 October) northern Luzon and Formosa raids (11-14 October) Luzon strikes (15 and 17 19 October) ; and the Battle of Cape Engano, (24-26 October). On 30 October, while Belleau Wood was patrolling with her task group east of Leyte, she shot down a Japanese suicide plane which fell on her flight deck aft causing fires which set off ammunition. Before the holocaust could be brought under control 92 men were killed or missing. After temporary repairs at Ulithi (2-11 November), Belleau Wood steamed to Hunter's Point, Calif., for permanent repairs and an overhaul, arriving 29 November. She departed San Francisco Bay 20 January 1945 and joined TF 58 at Ulithi on 7 February. During 15 February-4 March she took part in the raids on Honshu Island, Japan, and the Nansei Shoto, as well as supporting the landings on Iwo Jima. She also took part in the 5th Fleet strikes against Japan (17 March-26 May) and the 3rd Fleet strikes (27 May-11 June). After embarking a new air group at Leyte (13 June-1 July) she rejoined the 3rd Fleet for the final strikes against the Japanese home Islands (10 July-15 August). Belleau Wood launched her planes 2 September for the mass flight over Tokyo, Japan, during the surrender ceremonies. She remained In Japanese waters until 13 October. Arriving at Pearl Harbor 28 October, she departed three days later with 1248 servicemen for San Diego. She remained on "Magic Carpet" duty, returning servicemen from Guam and Saipan to San Diego, until 31 January 1946. During the next year Belleau Wood was moored at various docks in the San Francisco area undergoing inactivation. She was placed out of commission In reserve at Alameda Naval Air Station 13 January 1947. She remained in reserve until transferred to France 5 September 1953 under the Mutual Defense Assistance Program. Belleau Wood received the Presidential Unit Citation and 11 battle stars during World War II.